How is your grandmother’s roast like a period inside a quote mark? Somewhere along my path as a kid I heard the following story. Many of you probably have also. A youngster is watching his mother prepare the dinner roast. She cuts a chunk off of each end of the roast, sets it in the center of the pan, then surrounds it with potatoes and vegetables. He asks her why she cut the ends off. She tells him she learned how to cook from her mother, and that was how her mother did it. He asks why Grandma did that. Mom doesn’t know. In the case of the roast, the action had outlived the reason. Mom’s pan was big enough. The same lack of logic holds true for the period inside a closing quote mark. A song title belongs in quotes, but the period certainly isn’t part of the title, yet Chicago Manual of Style (CMOS) (and also AP, MLA and Strunk) wants the period inside the quote mark. The same rule applies to a comma. The rule for a question mark and an exclamation point are more reasonable. Both appear inside the quote mark if they belong to the quote and outside if they do not. Other punctuation, such as a semicolon or a dash, always appear outside the quote mark. So why not periods? The reason has to do with typesetters. In the pre-digital era, type spaces were fixed width, and placing the period outside the quote mark would leave what looked to be an extra space. In today’s digital world, just like Grandma’s roast, the reason is obsolete. In the early 1900s, the British decided to move into the modern age and place the period outside of the quote mark. But this placement is still traditional in the United States. We on the other side of the pond haven’t given in to logic. Did someone say metric system? In my last blog I followed the mystery novel from its inception up to the late 1800s. Sherlock Holmes and his powers of deduction had arrived with stories laced with clues and red herrings. While I love Sherlock and have reread Doyle’s stories many times, the writers that my father read to me and who influenced my writing and the development of my PI, Spencer Manning, were waiting in the wings. Many have asked me what it takes to be a writer. My answer is… be a reader. Read voraciously, especially in your genre of choice. I set down the first words of Change of Address, the first book in my Spencer Manning Mystery series, in the early 80s. But my first exposure to mystery novels was before I knew how to read. My dad was an avid mystery fan, and he read Hammett and Chandler to me when I was five or six. The true geniuses in any art form were the first ones to create something new, and they were usually treated with disdain and even hatred. Jazz was considered by many to be the music of the devil, and the early jazz musicians led hard lives as they developed a new genre. The early mystery writers invented a new genre that grew and branched into the many sub-species that exist today. Those who write today stand on the shoulders of the giants who started it all. But who were they? I’ll explore that question in this and the next blog. 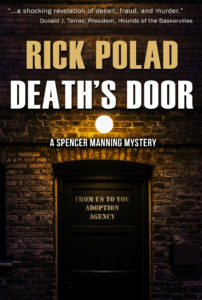 The seventh book in the Spencer Manning mystery series is about one-third done. This book is about drugs, a problem Spencer has yet to encounter. In the six books I’ve written so far, I’ve known what the basic plot was and who the culprit was. And in four of them I knew how I was going to catch him/her. The work came in surrounding the villain with a cast of possible suspects and filling out the story with clues and red herrings to make it interesting and, well, a mystery. In this book I have the opposite problem. To borrow a title from Ellery Queen, I have too many suspects. Spencer has an early discussion with Stosh about whom he can trust, and Stosh tells him he can’t trust anyone… Stosh aside of course. But in this book Spencer isn’t working with Stosh. Disclaimer: this blog has nothing to do with Spencer Manning Mysteries… except that it also uses the art of placing one word in close proximity to another with some sense of meaning. You all have seen video and photos of Kilauea erupting. It’s beautiful, and mesmerizing, and destructive, and… ironic. I’ll get to the irony, which is really the point of this piece. Most of us have lists of things we know we shouldn’t do because of the common sense factor, such as “don’t touch a hot stove.” There are, of course, exceptions among us. As a geologist, my number one rule is “don’t live next to a volcano.” Fault lines come in a close second. I would think you wouldn’t need a degree in Geology to realize that, but it seems not to be the case. And there are reasons why people choose to fly in the face of common sense. The American Indians didn’t have permanent settlements on the coastlines. Volcanoes, earthquakes, hurricanes… seem like good places not to build big cities. But the views are great! And commerce beckons. Still, cities on the coastlines are disasters waiting to happen. Mt. Ranier is a sleeping giant, as are all of the other gorgeous mountains in the Cascade Range along the west coast. A disaster in Seattle (and all of the other cities that lie on the Ring of Fire) is just a matter of time. I do realize that cities were built before the danger was known. But living in Seattle involves a risk. The risk may be negligible… the odds of it erupting in any given lifetime are small, but living next to a volcano, active or dormant, involves a roll of the dice. Seattle will be gone someday. I recently tossed a book into the recycle bin. I have thrown a few into the garbage (the ultimate protest) but have switched to being environmentally friendly – perhaps they will be reborn as better reading. We all have run across books that we didn’t finish for one reason or another. My most recent read got me thinking about what causes me to stop reading a book… it wasn’t the one I tossed. The main reason I stop is that it just doesn’t capture my attention… I don’t care about the characters or the plot. I read a lot of mysteries and the mystery had better be set up soon into the book. A book needs to grab the reader on the first page. 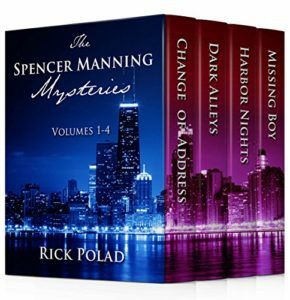 I make that my number one goal in writing the Spencer Manning Mysteries. It isn’t as easy as it sounds. Something you enjoy doing should be relaxing and a stress reliever. Right? You would think so… so would I. But I was recently thinking about suffering musicians… not emotionally from lack of money and the struggle of the game, but physically. I play trumpet. I take great joy in it, but jamming my lips in between a piece of steel and teeth has never been pleasant. I play with a bass player who has to wear a back brace because of the weight of the bass. And he is constantly shaking his hands to try and wave away the pain. Bass players play every measure of every song. And the guitar player has to build up tough calluses before the pain of pressing down on a steel string ends. Being a musician involves pain. But writing is different. I enjoy writing. When I get up in the morning I wonder what my characters are going to do and what new characters might drop onto the page seemingly from out of the blue. I don’t know if James Joyce had fun writing and rewriting Finnegans Wake. By the looks of his manuscript, maybe not. But for me, the challenge of putting together words to make a story is fun… or so I thought until recently. I have been checking my blood pressure periodically after finding out a few years back that it was high. Under normal circumstances, a magic pill brings it down to normal, in the 120/80 range. And exercise brings it down even lower—imagine that! After an hour workout it can be 105/65. One of the hats I wear is editor for my publisher, Calumet Editions. I correct a printed copy but then spend hours at the computer transferring the corrections to the file. It is a tedious and painstaking process. One needs to be careful not to miss anything. After a recent two-hour session, I checked my blood pressure and was surprised to see 185/90. Editing is stressful, so I decided the raised BP was from the stress. But then I tried an experiment. I spend time at the computer doing other things, one of which is working on Spencer’s next mystery. So I sat down and wrote for two hours. I expected a much better BP… after all, writing is fun! My BP was 178/88. I tried a few other things, like email and Facebook and Twitter (not that I expected those to be relaxing) with the same result. So it evidently doesn’t matter what I’m doing while sitting at the computer… something about it has very bad results. And what will be the result of those bad results? Who knows? If I were to listen to my conservative thoughts, I would shut down the computer in favor of longevity. But living without computers these days would be tough. Perhaps the thing that we can’t live without these days is something that I can’t live with. Just checked my BP – 165/85. I conducted the following interview with my detective, Spencer Manning, based on questions posed by readers. Some questions led to follow-up questions, and I had to cull out some questions that would have given away plot occurrences. I’ll follow up with interviews of other characters in the future. You are a big Cubs fan. Who is your favorite Cub? All right, give me three, but then see if you can narrow it down to one. Can you pick one of those three? What Could Be Bad About a Good Review? In my last blog I talked about bad reviews. Every author gets bad reviews. You can’t please everybody, and everybody has an opinion. But, as I pointed out previously, the ones that are irksome are the ones that aren’t fair, like the lady who gave me one star on my first book, Change of Address and ripped it apart. Her reason—she didn’t like mysteries. That’s just not fair. But Mom told me at an early age that life wasn’t always fair and I keep thinking it should be. My plan was to contrast the bad reviews to the good ones. It seemed like a great idea and an easy task… just pick out the reviews, copy them into the blog and write about them. I wanted to pick a few bad reviews for each book. And there I ran into a problem.